This is the Droid X360. 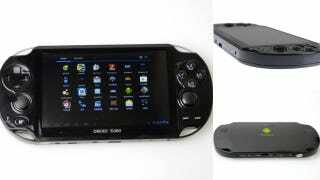 It's an Android powered PS Vita-looking device with a touch screen and nine different emulators for Nintendo 64, PlayStation, Game Boy Advance, Game Boy Color, NES, SNES, Sega Genesis and Sega Game Gear. Phew! It also has HDMI-out, a micro SD slot, mini USB port, 8GB of onboard storage, a rear 2-megapixel camera and a front 0.3 megapixel one. While it does not have a rear touch pad, it does have a big green Android logo. You can touch that all you like.